Am I Back? And to What? About the middle of December, I boldly announced I was taking a break from blogging and would be back after the holidays. Obviously, I wasn’t. Unless we count Groundhog Day as part of the holidays in which case, I’m a little early. So is the sunshine and warmth in this part of the country while in the Northeast, there are mounds of blizzard. But since I’m here, no doubt I’ll see the sun and thereby the forecast is for six more weeks of winter. Well, fine. 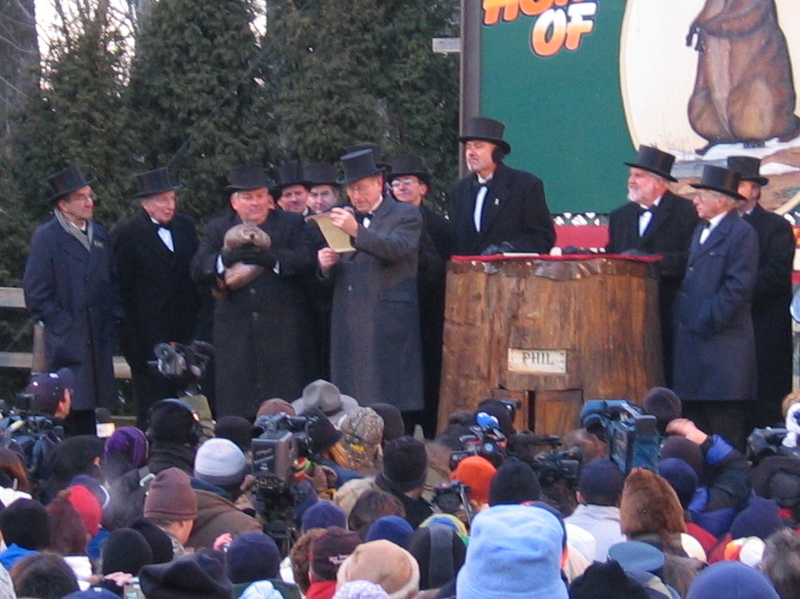 The groundhog, Punxsutawney Phil, is the little furry clump in the arms of the man just to the left of the man reading the proclamation. I wonder just what sort of fellow would hold a fat groundhog. I’ve been holding onto sanity. Christmas was nice. Quiet. Just the two of us, laughing and building fires in the grate. And doesn’t that sound romantic. It was. After Christmas, we drove up to the farm to our little house on the prairie for a week of quiet, METV and DVD movies, and some writing time for me. Only things changed. Life and death, I guess you could say. A good friend and farm neighbor died the second day of our week’s stay. We came back to Kansas City, a three-hour drive, got things ready that we would have done after we would have come home Saturday, drove back to farm and viewing and funeral. And came home to taxes for the farm. And then, oops, a grant that I didn’t know was due and which I did, now done, the farm taxes on a pile on the floor, and it’s almost Groundhog Day. But I’m okay. Doing one thing at a time. I watched a flock of young sparrows, yearlings by the look of them, one day on the farm. A sunny, windy, cold day. They gathered in the tree branches outside my window. And in unison, flew down to the ground and began pecking away at something, seeds too small for me to see, hopping sideways to the wind, and yet focused and although buffeted by the ground wind, in balance. Nature once more gives the lesson. Be present and balanced in the doing. “There is need of only one thing.” And the overriding and necessary thing in the world today is balance. And when we are in balance, our spirit soars and the sun rests lightly on our skin, even in the winter. I laughed! Christmas cards on Groundhog Day is something I’d do. And thank you for your condolences. He was a classmates of my younger sister by two (meaning the sister down from me two steps) so it was a double shock. Actually, anyone I know who dies now is a shock to the mortality system whether older or younger. Guess that’s for the rest of my life now. As to Love Song to Cuba, I saved it in my inbox until I could read it, and then in clearing out the inbox, I may have read (and I enjoyed it) and deleted it without a comment. I’m so sorry if I didn’t respond. Maybe everyone was scattered on Wednesday! I’ve always wanted to visit Cuba and when I lived in Mexico, I wanted to hop a plane and go, but didn’t, and returned to the States, Cuba unvisited. So I appreciated your review of your trip. That’s how I felt/feel about Mexicans. I met a Cuban band on a tour of Mexico. By that time, my Spanish was pretty good, but I sure couldn’t keep up with them language wise. They spoke fast, jazz lingo, with the sound of the sea. I think what poetry does is teach us how to hone prose. In other words, I write poetry, but prose is my main medium. And I’ve learned brevity and form from poetry. I don’t mean short sentences, rather the choice of a specific word that says more than three others. So what you might do now is go back and rewrite the original prose piece and see if you can hone and organize it the way you honed the poem. Just a thought. Or, another idea, write specific scenes from your time there rather than an overview. There. Now. See? Just what you needed – an assignment. Thanks so much for the conversation. What a great learning curve! Ah, yes, rewriting. I think most good writing comes in rewriting. I was so impressed with a Blogging U assignment to write a post but don’t post it; wait until next day and revise. Of course! I can wait, I can revise, which I do all the time with my manuscripts, but I’m more likely to dash things off on the blog. I lived in Mexico City and environs, sometimes stayed in Cuernavaca, a year renting a house in Tepotzlan in Morelos. And while I’ve traveled both the Pacific and the Caribbean coasts, never lived there. I spent one week on the Sea of Cortez one winter when I left Santa Fe and started south as far as I could get on the time and money I had. Left my old car in a parking lot, walked across the bridge, and got on a bus. I stopped in Topolobampo where the ferry docks from La Paz. Wrote a poem about the ferry from La Paz disgorging outside my room’s window. A little pension. Probably for overnight folks catching the ferry. But I loved the time there, alone, writing, walking, listening to water. That’s probably what I missed most living in Santa Fe: water! I don’t know that I’ve lived a gypsy life as much as a questing life. Although there were years when I said I was a gypsy. More than anything, I went when the time was right to go, usually about three years although a couple of times I managed five, and I stayed until it wasn’t. Now I’ve been in Kansas City for almost sixteen years and it astounds me. But then, I got married and bought a house. Now that will anchor a person. Mercy. We both love to wander and do whenever we can, sometimes only up to the farm, sometimes back to Baltimore (Cliff’s from Baltimore) and sometimes to Hawaii where my sister lives. But that’s only for a couple of weeks and then we come back home. Although we are in agreement that we will NEVER again own a house. What a lot to keep up with! Yeah, I’m a searcher. As for the Cuban stories, I think there’s a market for a good story now that the travel restrictions are lifted. Poetry is harder to sell, but a good story? You bet. I’m so proud of you for continuing the stories and poems from Cuba. I love every one. PS: every thought of a book? Glad to see you back, Janet, The vibes must have been in the air; I checked your blog yesterday to see what was going on. I did remember seeing that post that you were on a break. Missed ya! Thanks, Terri. Interesting that you checked in on me! And nice to be missed. Now, wait. You didn’t say precisely “when” after the holidays you’d be back. It could have been July, and we’d be just as happy to see you, although it’s very nice to see you sooner. It’s hard for me to remember Christmas at this point. It seems to have receded quickly. But the days are getting noticeably longer, and while I’m not looking forward to the heat of summer, which also arrives here quickly, I am enjoying the increase in light. Some of my plants are beginning to put on new growth, even though temperatures haven’t increased that much. They’re enjoying the light, too. You’re great…..and I didn’t say which holiday precisely, did I….Thanks so much for being happy to see me. We were cleaning up the front yard one warm day last week and I saw daffodil tips peeking through the dirt. Yesterday was 75 degrees, but it’s getting cold again, and rain predicted. Which would be good as it’s been a dry dry winter. A few years ago, our old house cracked walls in a dry winter. We learned. The drip hose runs all the time. And I can save the trees. Not so good for winter wheat however! Thanks so much! I’m touched by your words. It’s nice to be welcomed back. Really enjoyed reading your lovely thoughts.So sorry about the farm neighbor.Very sad. I’m glad you had time to write. Thank you. And thanks for reading. I am back to writing, both some here and on the book-length memoir. I was sooooo happy to finish a chapter today that I’d started before Christmas. REALLY really REALLY like this one, dear Sister. One thing at a time. Ah yes! Thank you so much, Big Sister! Its always good to hear your feedback. And I’m in a much better humor than I was the other day when I called, whining. Thanks for talking me down and making me laugh. You’re the best. ““There is need of only one thing.” And the overriding and necessary thing in the world today is balance. And when we are in balance, our spirit soars and the sun rests lightly on our skin, even in the winter”.— WOW! I love this. So much. Beautifully written. It is great to have you back! What a sweet thing to say! Thank you so much. It’s good to be back in touch with this community. Thanks for picking out that paragraph. I keep reminding myself all the time. Today I got to spend about five hours on the memoir and completed a chapter that had been in the works since before Christmas. And that felt balanced. Yea!! Thanks for the kudos. It feels good to be back writing. And I even worked out today. Now that’s balance!